Phoenix Tube and Shell Oil Cooler Service from Colby Welding & Radiator, Inc.
As Phoenix's tube and shell or panel oil cooler specialists, there’s no better choice than Colby Welding & Radiator, Inc. when it comes to engine oil coolers. Our technicians have over 150 years of combined experience dealing with automotive, industrial, and construction engine oil coolers. Whether your tube and shell oil cooler just needs a little maintenance or requires a complete replacement, you can count on our skilled technicians to handle any issue quickly and precisely. Phoenix Tube and Shell Oil Cooler Service Benefits from Colby Welding & Radiator, INc. 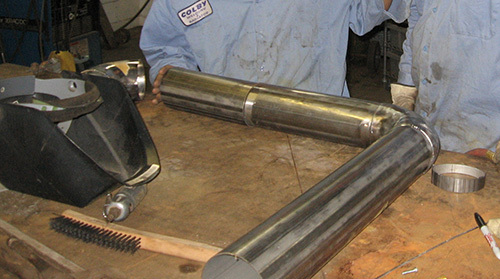 Choosing Colby Welding & Radiator, Inc. for your tube and shell oil cooler needs means you’ll get experience, skill, and timely service. Since we understand the industrial and construction industry, we know just how important it is for you to receive fast, reliable service for your tube and shell or panel oil cooler. Being unable to use a vehicle or equipment for any length of time means a loss of productivity and profit for you. That’s why our expert tube and shell oil cooler technicians will be on the job as quickly as possible to ensure your engine oil coolers are back in service in no time at all. Contact Colby Welding & Radiator, INc.
For professional tube and shell oil cooler services in Phoenix, contact Colby Welding & Radiator, Inc. today at (602) 258-7147. To learn more about our experience with engine oil coolers for the automotive, construction, and industrial industries, you can also reach us through our Contact Us page. © 2011 - 2019 Colby Welding and Radiator, Inc., All rights reserved.